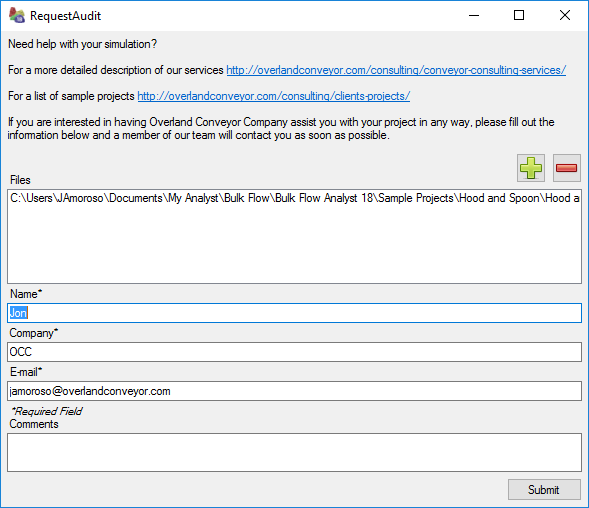 Overland Conveyor Co. is excited and proud to announce the release of Bulk Flow Analyst Version 18.1. We welcome any comments or suggestions about the new version so that we can continue to improve its functionality and usability. The new version can be downloaded and installed through the program for users up to date with MES. If the update screen does not load during startup, please check for updates through the help menu. A current Maintenance, Enhancements and Support (MES) agreement is necessary to receive Bulk Flow Anaylst™ 18.1. If you are not up to date or have any other questions, please contact Tawna Kjera at kjera@overlandconveyor.com for more details. Importing your 3D model into Bulk Flow Analyst™ Modeler has been the recommended way of interacting with your model. One disadvantage to adjusting the injection region size and location was any modifications needed to happen at the CAD level and re-imported into Bulk Flow Analyst™. Version 18.1 provides the user the flexibility to add and adjust the injection region automatically by referencing a discharge conveyor. The injection region will automatically be centered over the discharge conveyor with the flexibility to change the height, length, width, clearance from the discharge conveyor, and clearance from the tail. Automated injection regions are best utilized with conveyors, but what if you have a unique simulation to analyze? Injection faces have been updated to be oriented in any direction necessary. 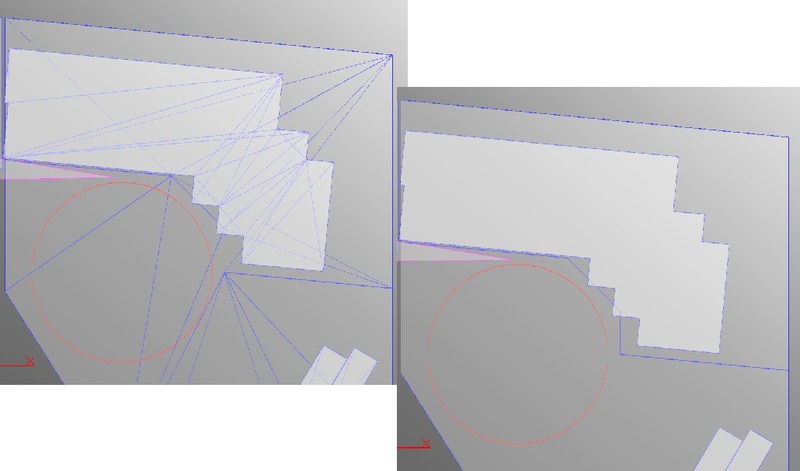 In the past injection faces needed to be perpendicular to the z-axis and now they can be askew from the z-axis. Bulk Flow Analyst™ previously needed the gravity vector to be oriented in the negative Z direction. It was required to update the CAD model before importing the model in to Bulk Flow Analyst™. Now changing the gravity direction is as easy as selecting the direction in Bulk Flow Analyst™ in order to match your model. * 2D sprites for screenshots and movies is currently still in development and will be released soon. 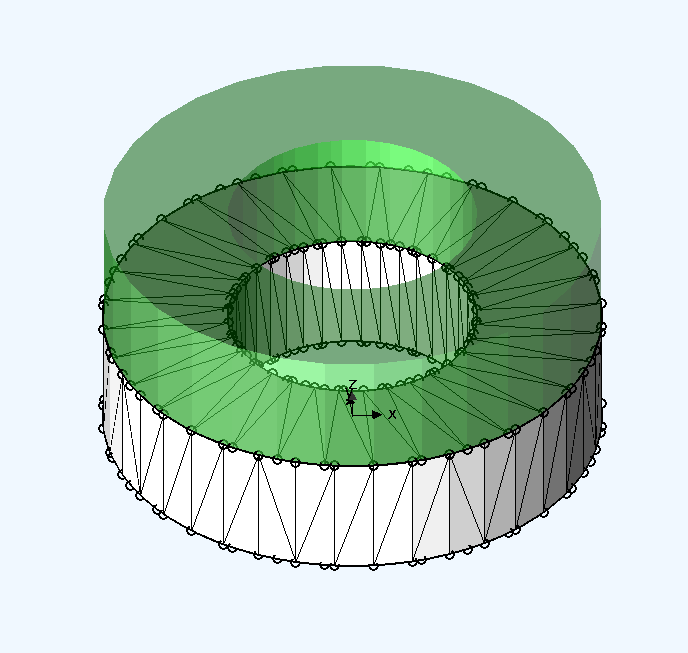 Bulk Flow Analyst™ 18.1 has the ability to hide co-planar edges for a simplified appearance. The user has the option to turn this feature on and off to visualize how the program tessellated the surface while a cleaner appearance for videos and images. A current Maintenance, Enhancements and Support (MES) agreement is necessary to receive Bulk Flow Anaylst™ 18 upon release. If your MES is expired or runs out by January 2018, Overland Conveyor Co will send a renewal quote within a few business days. Renew MES before Bulk Flow Analyst™ 18 is released and receive a discount. Please contact Tawna Kjera at kjera@overlandconveyor.com for more details. Our main goal for Bulk Flow Analyst™ 18 is making the user experience more intuitive and easy to use. We understand the challenges of simulating your 3D model while navigating the complexity and details of Discrete Element Modeling. Bulk Flow Analyst™ was originally designed by engineers to help analyze and optimize transfer chutes. Our project engineers at Overland Conveyor Co. use Bulk Flow Analyst™ to this day. We are in the unique position of experiencing the software, not only as a developer, but as an engineer and user. For this reason, we are focusing on regular online training for Bulk Flow Analyst™ 18. Stay tuned for future LIVE events and schedule. Now you can input your size distribution directly into the software, and quickly select the desired material sizes to simulate. The new Material Studio automatically calculates the mass fractions based on your selected material sizes. The Material Studio will also automatically generate random lump shapes for each material size to better approximate rock shapes. If you want to change the lump shape, simply select a material size and regenerate. Bulk Flow Analyst™ has progressed from single particles to preset lump shapes in previous versions, and now we are proud to announce random lump shapes. Real life rock shapes are not symmetrical or perfectly round. Now your simulated material won't be either. 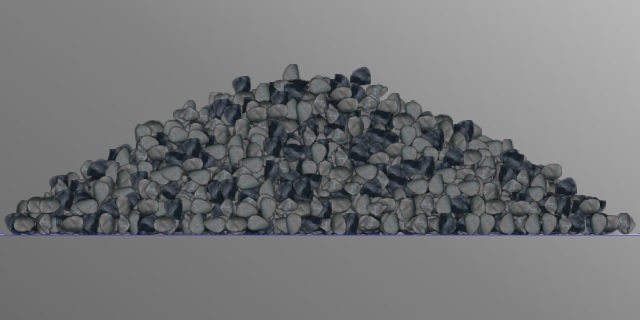 Build a unique lump shape for each material size to better approximate the randomness of rocks. Some projects only need a concept design while others need a quick analysis of an existing design. For the first time, Bulk Flow Analyst™ will include the new General Material Library. This will have predetermined material properties based on your material density and angle of repose. It is as easy as selecting your material and running a simulation. Even better, the General Material Library will actively be updated. The Material Library will be shown above the Project Material List for ease of opening, editing, and saving materials. Multiple library files can be viewed at the same time, and reorganizing materials is as fast as drag and drop. Bulk Flow Analyst™ 18 allows users to input a ramped speed duration to analyze starting and stopping conditions. Simulate differential stop times and analyze the transfer chute capacity. Then start the receiving conveyor back up and observe how the material is pulled away. 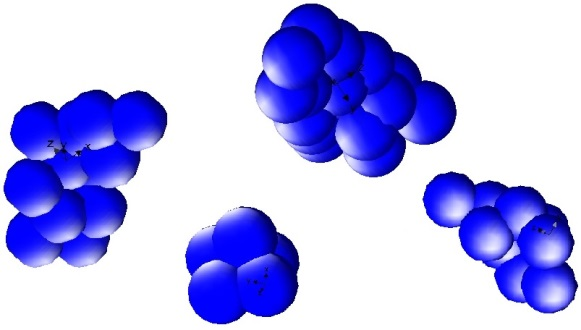 Determining the Discrete Element Modeling parameters to accurately simulate your material is admittedly the most difficult process in setting up simulations. We recognize this and material characterization is a topic we discuss continuously. The updated material characterization in Bulk Flow Analyst™ 18 has taken a more direct approach to gather necessary data with quick, simple tests which could be performed onsite. The test results are used to run the material characterization and optimized your material parameters. Run your simulations up to six times faster in some cases or simulate smaller particle sizes. The faster run time allow engineers to analyze more design iterations quickly. The smaller particle sizes provide a more detailed final simulation and reveals where additional refinement on final designs may need to be considered. We have updated the user interface to include toolbars on each tab and moved the Modeler controls above the model as a ribbon. The dividers between lists and the on the material studio can be dragged to create a custom look and feel. A new advanced mode has also been added to clean up the user interface when advanced mode is unchecked. We simplified which parameters are shown for basic mode while providing the flexibility to change any parameter in advanced mode. Is adhesion or curvature mesh quality not necessary? Leave the program in basic mode and have a cleaner look. Need help with your simulation? Request Audit allows you to send your project file and any additional files to OCC to review. Fill out the form and we will contact you as soon as possible. We completely reworked the Bulk Flow Analyst™ help files from the ground up. The new structure breaks topics into Preprocessing, Processing, and Postprocessing to make the help files more searchable and to keep your focus on the project at hand. 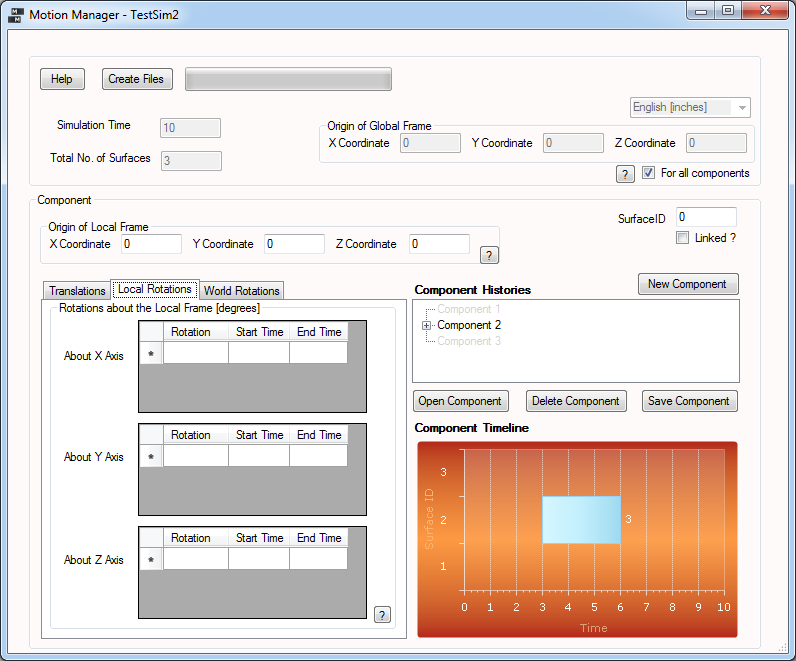 Applied DEM announces today the release of Bulk Flow Analyst™ v.16.0. This release features a new Gaussian particle size distribution for Material Conditions, the ability to select more complex injection geometries, and improvements to the maximum limit of useable components in a simulation. The release also features several bug fixes. 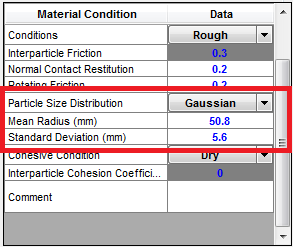 Users can now select “Gaussian” as a particle size distribution for Material Condition components, and are also able to specify the average radius and standard deviation (in radius units) to use for the distribution. The DEM simulation will contain particles that have the specified average radius and the total particle size range will be approximately plus or minus 3 times the standard deviation. Bulk Flow Analyst™ 16.0 allows users to select any planar surface in their mode l to extrude in the z-direction as an injection volume. 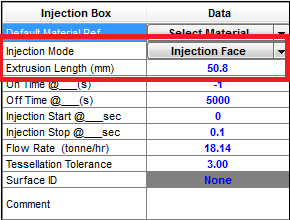 These “injection faces” are the recommended method of selecting an injection volume as they are more flexible than selecting body diagonals. For example, you may want to create injection boxes that are cylinders or injection boxes that are hollow. This may be accomplished very easily using injection faces, but cannot be specified using body diagonals. Body diagonals are still available to use for legacy projects. The user simply specifies the Injection Mode for the Injection Box, selects the surface(s) in the model, and sets the Extrusion Length for the injection box. In BFA Modeler, the extruded volume is shown as a transparent object. Simulations that previously failed to run due to the number of components are no longer limited. Improvements have been made to the maximum number of selected components when multiple components share the same properties. When we first implemented the DEMcloud, we created formulas for estimating the run-time of cloud-run simulations based off of a set of simulations that we had run. These estimates were effective for simulations similar to our base cases. However, there were some simulations that always caused the estimates to be thrown off. For example, simulations with long run times, in the hundreds of seconds, would often cause the estimator to return several-thousand-hour estimates. We have significantly improved the speed of processing. Results may vary depending on the situation, but there have been improvements in the neighborhood of 30% for both DEMcloud and local simulations. Clients using component patterns often had difficulties using them when their path had shape including a concave curve. With this improvement, nearly any 2D shape can be used as a path. The example below shows a path with two concavities and the component being patterned around it successfully. Several items were improved in regard to how the motion manager works. There were some bugs fixed, but in addition to that there was a change to the way that components are referenced. No longer do you have to remember the suface ID of the component you need, the component name is listed next to the surface ID. Material characterization simulations are a complex feature. Users enter results from physical tests performed on their materials, and BFA runs simulation after simulation, adjusting material properties all the while, in an attempt to replicate the results of those tests. Some of the tests use a particle count that is sufficiently high that each individual test takes a while to run. In short, material characterization simulations, as convenient as they are, may take several hours to run on a user's local workstation (depending a lot on the material being tested), primarily because these individual tests run in sequence, one at a time. 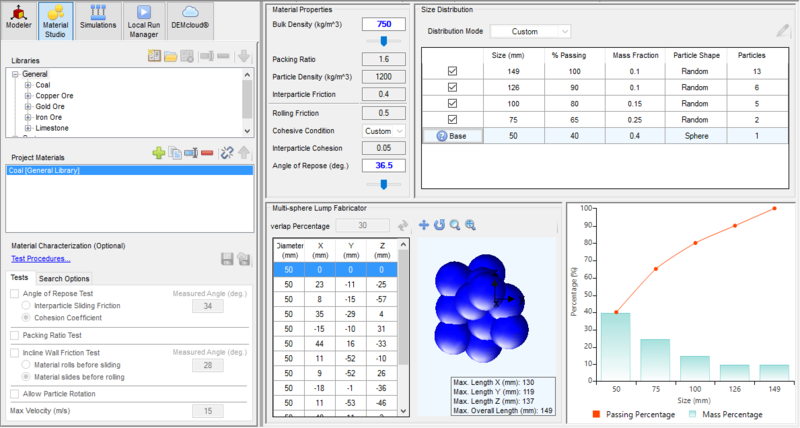 With version 15.1 we have added the ability for users to send their material characterization simulations to the DEMcloud® for faster processing. Because many simulations can be run simultaneously on the cloud, as many as 8 individual tests can be running at once, allowing the material characterization simulation to finish in a fraction of the time! To make them even easier to use, we are offering material characterization simulations on the DEMcloud at a very affordable price. Try one today! Applied DEM introduced the ability to define clusters several releases back. Clusters give users the ability to define a particle shape that isn't purely spherical which allows the geometry to drive how the particle moves. In previous versions of the software, users had to define multiple material condition components to define multiple cluster shapes. Each time an injection box was added to a simulation, users would have to add each of the material conditions and apply the approriate breakdown of mass contributed by each material condition. 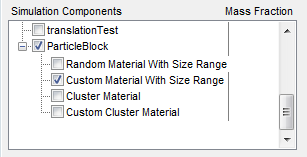 Starting in version 15.0, users can define multiple cluster shapes in a material condition, much in the same way Custom size-distribution is used. The user specifies a number of cluster shapes to use, then defines the shape and mass fraction this shape contributes to the material. Prior to BFA v15, Particle Block components (Uniform nor Random) could not accept a material condition with a material size range. Particles had to be uniformly sized. For Random materials, this meant that the Min and Max size had to be equal. Custom materials were simply not allowed. Clusters were not allowed at all. Now users of Random particle blocks are able to use material conditions with a size range. Random materials and Custom materials with size ranges can be generated within a particle block. Random particle blocks can also accept material conditions generating clusters, whether those are custom clusters or not. Motion Manager Makes a Strong Comeback! Users of BFA prior to version 14 were able to use a tool called the Motion Manager, which allowed users to define complex movements for components. Components were able to move and rotate, stop, reverse direction, and easily link one component's motion to another moving component (think leg-bone connected to the thigh-bone). This tool simplified the definition of common components like flop gates and dump bodies that remain stationary, then rotate, then remain stationary again. However, it also allowed for the definition of more complex motions, such as bucket wheels rotating on two axes. Due to the change of numerical engines, BFA version 14 did not include the Motion Manager. But it's back! Enter the value of your component's surface ID on the center right, then use the translation, local rotation, and global rotation tabs to specify distances and angles traveled in a given time range. Enter negative distances to move backward, overlap motions, link this component's motion to another moving component, the possibilites are nearly limitless. Click "Save Files" and run your simulation as usual. You can simulate extremely complex motions, all the while BFA will be determining how these motions affect the flow of your materials. We continue to develop and improve our DEM clusters and have added several useful features. We now support inserting multiple cluster types from a single injection box. Also we've improved our internal calculations to allow larger clusters made of more particles. With the ability to simulate larger clusters, we've also provided new shapes that are more customizable and an option to generate a random cluster shape. Additionally, users may design their own clusters shapes by specifiying particle size and location by hand. All of these are additionally supported by our new interactive cluster design window. Providing new useful ways to view the data created by your DEM simulations is one of our top focuses. Our newest version of DEMView supports coloring particles by the cluster they belong to and by angular velocity. Additionally, we've provided the tools to define different groups of particles and then color the particles based on these groups. This feature can be useful for clearly identifying flow patterns in hoppers and silos. To see a demo of this feature Click Here. We're very proud to introduce our Material Characterization Simulations. Using commonly known properties of your material this tool runs a series of simulations back-to-back which work towards optimizing your material properties for DEM. These characterization tests all generate pdf reports of the results and automatically add the optimized material to your simulation! Defining cohesive properties has been made much easier as well. All that's needed to provide the general description of how cohesive your material is, and BFA will calculate appropriate values to use for the material. Using BFA Modeler you can now hide entire components as once, preventing the need to pick every face you wish to hide. Fine tunning and minor adjustments have been made to clustered materials. These simulations will save faster and run much smoother than in the past. DEMView Interface and Speed Improvements! The DEMView interface has been given a large facelift, it's now faster and easier to use. We've added a timeline to quickly move through time in your finished simulations which includes a Play button to animate DEMView. We've improved the speed of DEMView while panning, zooming, and rotating by decreasing particle quality automatically during these actions. Overall draw speed of each frame is increased and so is video creation speed! Using DEMView to specify the desired view and setting, you can now create videos for cloud simulations using the cloud. This prevents you from having to download potentially large results files to your local machine. BFA now allows you to save your simulations wherever you want instead of only in the project folder. We've also removed the restriction of your project having to exist in a folder of the same name. The safety and protection of your data is our highest priority. We've updated and enhanced our encryption data and database security to keep your simulation data safe.